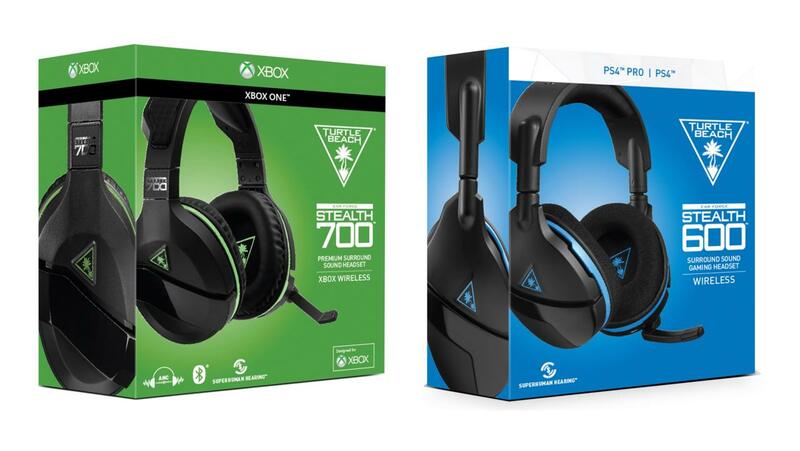 Turtle Beach announced two new headsets today that are geared towards console gamers: the Stealth 700 and Stealth 600. Both models will have separate SKUs for PlayStation 4 and Xbox One consoles and offer wireless connections. While the PS4 model connects through a USB dongle, the Xbox One version will be one of the first headsets to connect to the console directly. Turtle Beach touts virtual surround sound as one of the key features of these headsets. The Stealth 700 offers DTS Heaphone:X technology for virtual 7.1 on PS4 and the Stealth 600 uses proprietary surround tech from Turtle Beach for both systems. All models are equipped with 50 mm audio drivers and incorporate exclusive “Superhuman Hearing” technology that is supposed to emphasize minor in-game audio cues like footsteps. Each headset is also said to fit comfortably for users who wear glasses. Battery life is projected to last between 10 to 15 hours on a full charge. A few differences set the two headsets apart. The Stealth 700’s ear cups feature a synthetic leather upholstery while the Stealth 600 uses a breathable mesh. Bluetooth connectivity and active noise cancelling are also exclusive to the Stealth 700’s. The Turtle Beach audio app will also allow 700 users to tweak equalization settings and set dynamic chat volume to match in-game volume. The Stealth 700 and Stealth 600 headsets will cost $ 150 USD and $ 100 USD, respectively. Turtle Beach is taking pre-orders on its site today and all SKUs are set to release sometime in September this year. Xbox One Gets Official Reddit App, Available Now–What Do You Think? Tagged also, Available, Beach, Connect, Directly, First, Headsets, Turtle, Upcoming, Xbox.